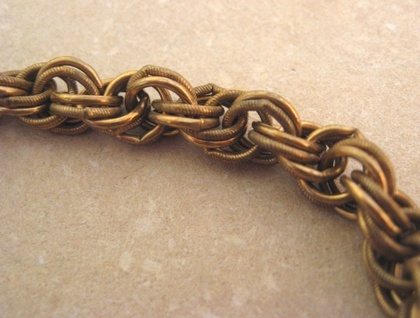 The lovely chain of this bracelet is a handmade, Monet-style chain made of aged brass rings. Some are textured and some smooth, creating a subtle pattern through the chain. 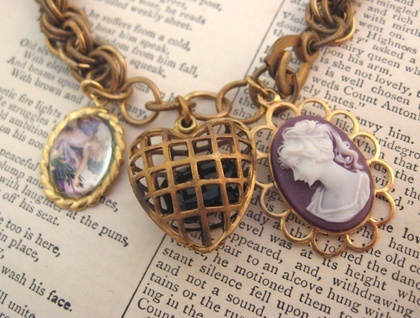 Near the old-fashioned brass clasp are several single rings, adorned with three vintage charms. One is a vintage cameo, depicting a beautifully detailed lady's head in white on a purple background. 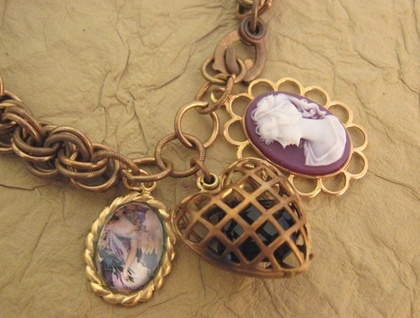 The second is a rare, brass cage heart locket from the 1950's-60's. It houses a 1960's Swarovski crystal in transparent purple. (Vintage Swarovski crystals are quite rare and are in fact a collector's item.) If you wish to insert your own little treasure or keepsake, prise the locket open carefully with a pair of needle-nose pliers and swing both halves sideways. All three charms are attached with tiny, vintage brass rings. This bracelet measures 21.5 cm, from the clasp to the final jump ring. To adjust the fit, the clasp can be hooked onto any of the single brass rings, leaving a the charms to form a longer or shorter dangle. The old-style clasp can be fiddly to fasten at first, but once you've got the knack of it it's easy. 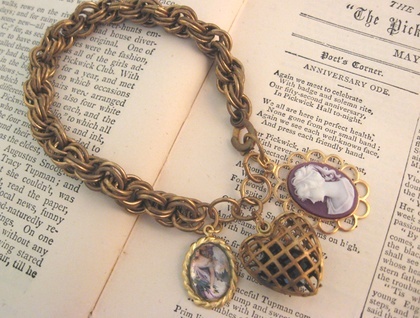 The solid brass chain gives this bracelet some heft to it, and the charms tinkle slightly as you move your wrist. The chain feels gorgeous to handle and to wear. A very distinctive, heirloom-quality piece. Silverlight Jewellery designs are handmade works of art. Each one has a unique name and number, and will never be repeated. Silverlight Jewellery ... exquisitely eclectic.